Spotlight Sunday is series of interviews designed to introduce and highlight Chicago Urban Sketchers individually. Now that our chapter has reached nearly 500 members it has become more of a challenge to meet every single member in person and have a meaningful conversation. These posts concentrate on individuals and speak in their own words. Hi Dave, thanks so much for taking the time to chat. I always enjoy seeing your sketches posted to our Facebook group. ANDREW: How did you first hear about the Urban Sketchers community and what made you decide to join Urban Sketching Chicago? DAVE: Thanks very much for asking me to be a part of this series, Andrew. I first heard of Urban Sketchers, I believe, through Twitter, though it may have been another city’s chapter. I was so happy to discover that Chicago had a chapter that met monthly. My first meetup was the water taxi outing two years ago, and from there I was hooked. I look forward to every outing. ANDREW: The water taxi event was a lot of fun. One of the reasons I like our group is that you end up visiting places (and in this case, taking a different modes of transportation) you may not have normally gone to had it not been for the group. 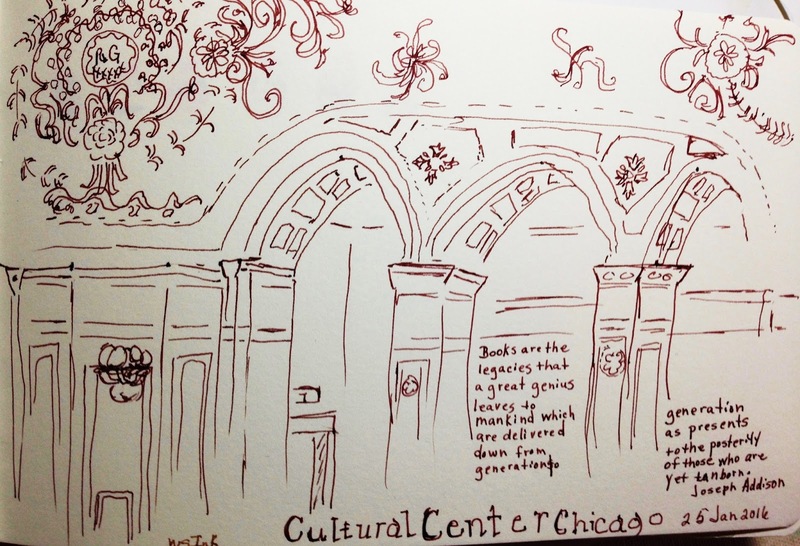 I believe that is the first time we met as well.Did you sketch before finding USk Chicago? If so, when did you start sketching? DAVE: Previous to the USk Chicago meetups, I did very little sketching on my own, which I’m not proud of. I still need to get into the regular habit of sketching in between meetups, though I am getting better at it. I’ve always done preliminary sketches for my illustration work and would occasionally sketch people on the L or in airports, but very little outdoor or architectural sketching. During the Occupy movement, I would sometimes go downtown and sketch the people there. ANDREW: As a professional illustrator, does urban sketching play a role in your day to day job? If so, how does it help you? 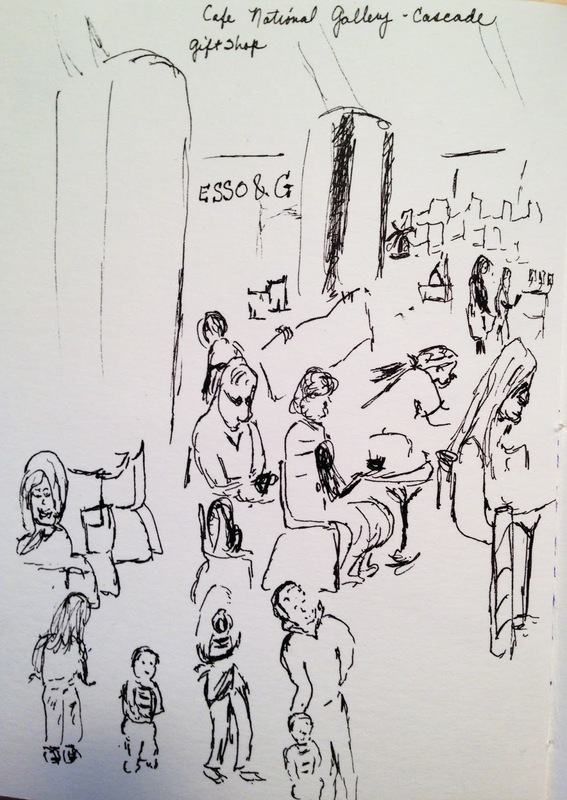 DAVE: Urban sketching has definitely helped my sense of observation and sharpens my fundamental skills. Sketching also gives me a sense of connecting to a tradition that goes back centuries. Also as a freelance illustrator, it’s nice to get out of the studio and interact with other artists. I’ve met such great friends at USk outings! ANDREW: I have the same experience, working from home myself. It's always inspiring to get together with our group, with so many people who have the same passion for art and sketching as I do. I've also met some great friends along the way too! I really appreciate the line work in this sketch. The lines are very deliberate, yet loose and highly descriptive all at the same time. I see this technique in much of your work. Can you talk about this style and how you developed it? Does it tie into a particular background or training you have had? DAVE: Thanks, Andrew! My dad was always into drawing, especially political cartooning, and he encouraged my early interest in drawing. Then there was Mad Magazine, which I devoured and introduced me to the work of caricaturists like Mort Drucker and Jack Davis. Later, at the American Academy of Art in Chicago, I had the late Eugene Hall as a life drawing instructor. His enthusiasm and energetic drawing style was a big influence. After graduation, I worked as a storyboard artist at Foote, Cone, & Belding ad agency, where we needed to further develop a quick, expressive style to convey action & emotion with just a few lines. DAVE: My two dogs are always a great source of inspiration (and they never complain if I make their noses too big). I’ve always been more comfortable drawing organic things like people, animals, and foliage as opposed to man made structures. That’s why I’m so impressed with the work that you and others post of buildings and architectural details. I’m hoping to get more comfortable in that area. DAVE: Though my illustration work for the most part is created digitally, it always starts with a series of preliminary sketches, usually with pencil or Sharpie. My USk sketches to this point have been done using Sharpie or Tombow brush markers on toned paper with white conté highlights. I’ve added occasional watercolor washes too. DAVE: I can honestly say that everyone at USk inspires me. It’s such a pleasure to see such a great variety of styles and medium. I also occasionally go online and do Twitter searches for #sketchbook and #urbanSketch. It’s astounding to me how much incredible work is being done on a daily basis. I also recently read New York artist Molly Crabapple’s memoir “Drawing Blood”. I like the way she uses her sketches to inspire activism. ANDREW: If you had to narrow your sketch kit down to your three favorite sketching tools, which would you choose? DAVE: In the previous interview, Fred Polito said that he’d like to expand his tool set, though his watercolors are so masterful, I can see why he’s tempted to stick with them. I feel the same way about exploring additional tools, rather than getting too comfortable with a routine. Still, if I HAD to limit it to three, I guess I’d have to go with toned paper, Tombows and white conté. ANDREW: Fair enough! I threw you a curve ball there, but I can't help but agree that it's also tempting to try different media on occasion. I think it comes naturally to creative types. DAVE: I have two sites. One, at http://davesink.com is my personal Illustration website and blog, and another website run by myself and a partner, at http://dipstickstudio.com, features graphic recording and whiteboard videos. Thanks again Andrew. I really appreciate all the work you and the rest of the USk Chicago organizers do for the group! ANDREW: Thanks for your time Dave! This week's Spotlight Sunday features the watercolor visions of Fred Polito, an architect and urban sketcher from Northbrook. 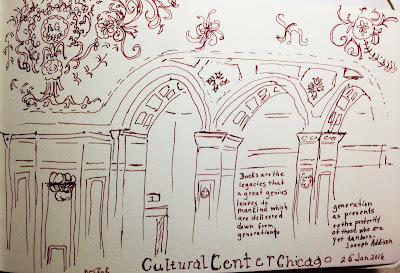 I was immediately attracted to Fred and his sketches when I first met him at The Den Theater in Wicker Park for our Urban Sketching get together last year. I personally have not mastered watercolors so I am always interested to learn more from those who do. That is why I was excited to interview Fred and have the chance to introduce him to the rest of you. Wes: Hello there Fred and thank you for agreeing to participate in my interview. 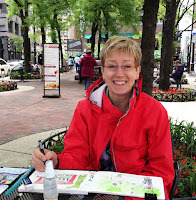 I am interested in how you learned about Urban Sketching and what made you decide to join Urban Sketching Chicago? Fred: My wife and I were on one of our typical weekend outings in Chicago, she with her knitting and me with my sketchbook. While walking thru Lincoln Square, Alex Zonis saw me sketching, I saw the Urban Sketchers group doing the same, we talked and I joined the group. It was a very fortuitous meeting. I've enjoyed the energy that the Group has given me. Wes: Fred, why do you sketch and in what ways does it help you? Fred: When I make a sketch, I enjoy the focus it brings to my time and mind and how it uncontrollably reflects what I'm really thinking and feeling at that moment. Wes: I am such a big fan of your work and to see you create some of the freshest views of a particular scene. I find your work inspiring. What then inspires you and the sketches you create? 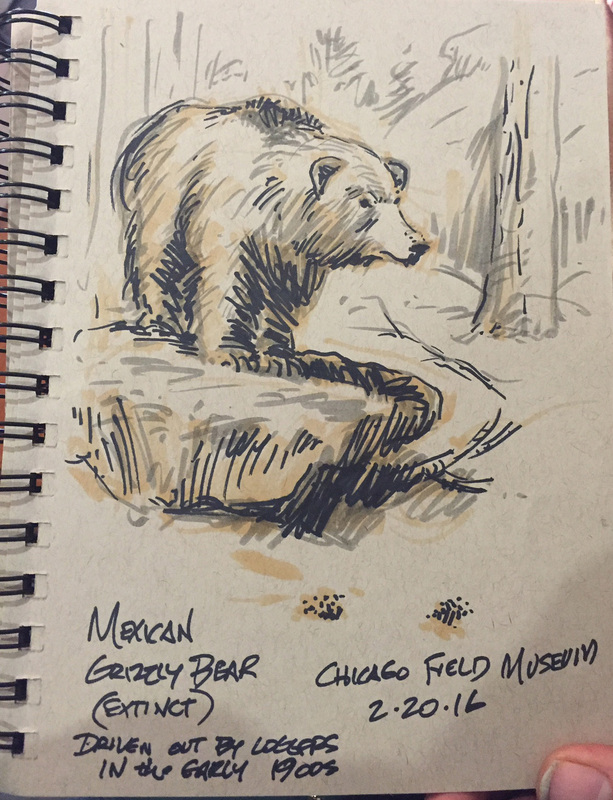 Fred: When I look at these 2/20/16 sketches, I don't see the Shedd Aquarium or the inside of the Field Museum as much as I hear the sunshine and remember a sparkling, almost Spring-like day. And then a great early dinner at Uru-Swati Indian Restaurant and having Urban Sketchers to thank for getting us out of the house. Wes: Fantastic. Whenever I see your work, I am amazed at how you command the watercolors in your sketches. Are watercolors your favorite sketch tool or do you have others? Fred: A 4B pencil and watercolor paints with big brushes are, perhaps too much, my favorite tools. A bigger variety of tools would help develop more variety in sketches. USK: Now, you live in Northbrook and I know a lot of your work takes place in the Chicago area. But where is your favorite place to sketch? Fred: A side table in a cafe on the street, preferably in France. Wes: Haha. I need to get to France myself. What do you do when you are not Urban Sketching? Do your sketching skills play into your day job? If so, how do they help you? 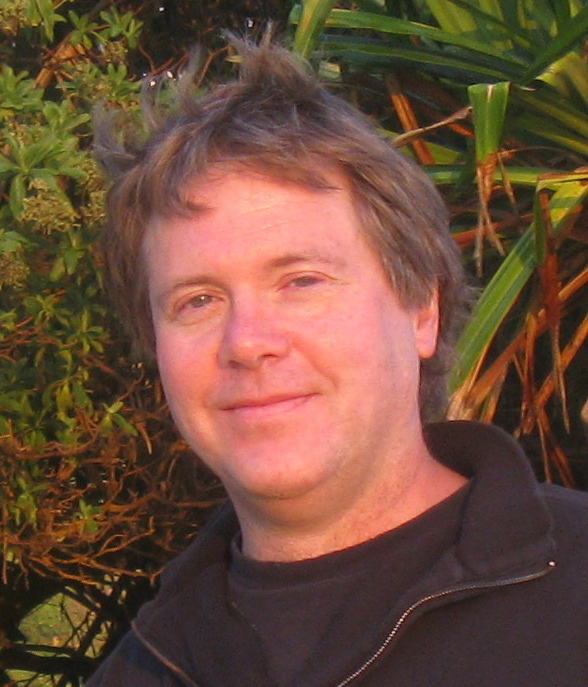 Fred: My urban sketching is an off chute of all my earlier hand drawings for my architectural designs. Now, my office makes the designs with computer produced drawings. Samples of my drawings can be see on my website by clicking on "Artwork." Wes: Fred, I am excited to learn more about the sketches that you sent me. Tell me about this first one which looks like the Field Museum in Chicago. Fred: Yes, for this first sketch, my wife and I were walking thru Grant Park toward the Field Museum and the Urban Sketching Event. We were enjoying the wonderful February weather and the people watching opportunities. We spotted a park bench. I was feeling the energy that the day and site was giving and also feeling the time constraint for a sketch. Hence, pencil and quick washes, trying to express the monumental scale and classical architecture of the Field Museum in 15 min. I remember the park bench the most. Wes: Thanks Fred. I do remember that warm day and how I hated to be inside the Field Museum. While I was inside drawing replicas of dinosaur fish and warthogs, you seemed to take advantage of this opportunity to sketch outside. For this second sketch, it appears that you sketched the Shedd Aquarium, is that right? Fred: Yes. Meeting with the Urban Sketchers group inside the Museum and considering the sketch possibilities, I agreed with my wife that the day was too nice to spend all indoors. Plus the City location can't get much better. Sketch 2 was supposed to be about the color, trees and building forms of the view of the Shedd Aquarium as seen from the Field Museum steps. What I remember most was talking with students from Manitowoc, WI and a family from Springfield, IL and why I so like Chicago. Wes: Nice! As I am looking at your third sketch, I see that you finally made it inside the Field Museum. Did the weather get colder? Was the sun going down? Tell me a little about this last sketch. Fred: Losing my spot in the sun and getting texts from my wife that she had a front row table at the Field Museum Cafe, I headed inside, settled in and felt more relaxed and in and under control. The resulting sketch, in my mind, conveys that state. Wes: I guess that is all the questions I have for now. Thank you Fred for being so generous with your time and sharing your talent with us. To my fellow artists and fans of Fred's work, be sure to stop by and say hello to Fred next time you see him at one of our USk Chicago Let's Sketch events. Barbara Weeks: Thanks for agreeing to this interview, Cathy. Tell us a little about yourself. 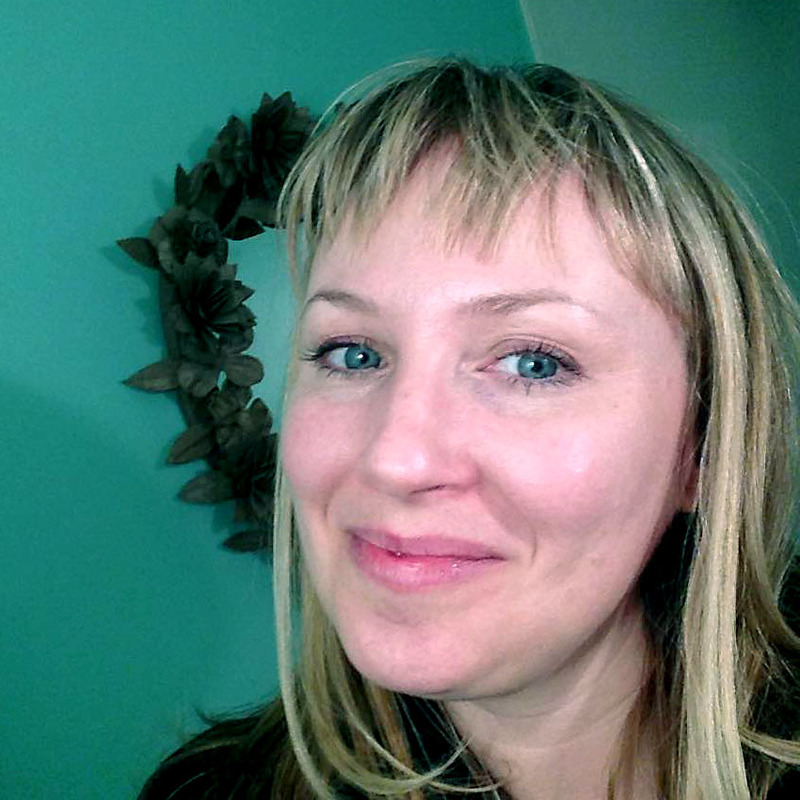 Cathy Turley: I’m originally from Kalamazoo, Michigan. (“Yes, there really is a Kalamazoo!”) I came to Chicago to go to Moody Bible Institute. I’ve lived in Chicago for the better part of 25 years. I am a graphic designer/production artist at an advertising agency. I’ve always considered myself artistically inclined, but not something I have developed regularly. BW: What prompted you to join USk Chicago? CT: Somehow I stumbled across the Instagram feed of USk Chicago (@uskchicago) just before the Sketch Seminar last summer. I liked the sketches I saw on the feed and when I heard about all the giveaways for the seminar, I thought, that’s a really great deal! Then I attended the seminar and I got excited about drawing again. BW: Why do you sketch? CT: I love it. I like trying to accurately represent something I see. It uses a different part of my brain – a different type of focusing. Plus, I like getting better and meeting other artists. BW: Do you have a favorite sketching medium? What do you like about it? CT: I enjoy using pencil, followed by watercolors and then black ink. Right now I’m using a student watercolor palette and LePen Drawing pens. I had tubes of paints in college but they're all dried out. I figure it’s good just to sketch with any medium at hand. I, also, like the watercolor sticks we received in our swag bags at the seminar. I want to try the Velasquez palette, just three colors, Ultramarine Blue, Burnt Sienna, and Yellow Ochre. I like the portability. CT: "I enjoy ornate buildings and architectural details." BW: If you could sketch anywhere in the world where would that be? CT: I would be a tourist artist in Paris: little folding seat, travel easel, beret(! ), sitting on the Seine sketching the city. My husband and I went to Paris for our 5th anniversary. When I saw the green booksellers booths and artists along the river, I got choked up. I said, “it’s just like the movies”. It would be a dream come true to travel through Europe and sketch. Oh, Rome! BW: What artist(s) have had the most influence on you? Why? CT: My watercolor instructor, Jim, at the Lansing Community College in Michigan. He gave us an overview of art history, as well as teaching us watercolor techniques. BW: We know you’re on FaceBook, do you have other social media accounts that you’d like to share? CT: I love Instagram. Take a look: @CathyTurley. I like graffiti, architecture, knitting and drawing. CT: "I'm working on drawing people more accurately." BW: Cathy is a loyal attendee at our monthly sketch meets. She’s introduced herself to us, so be sure to say hi if you see her at our third weekend of the month sketch meets! Wonder where we’re meeting next? Click on the “Sketch Crawls” tab in the toolbar. I hope you'll join us! 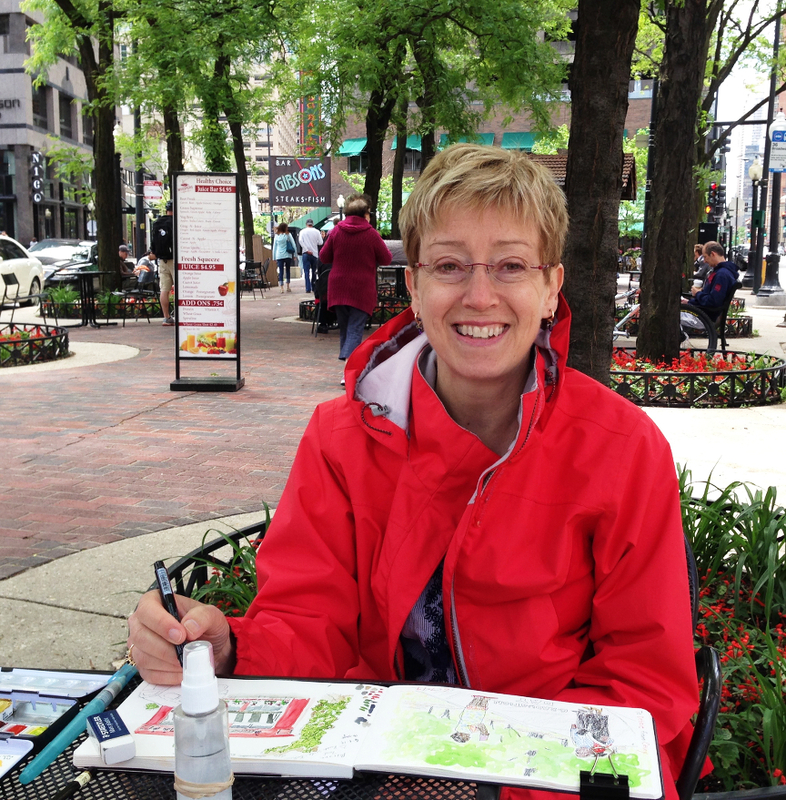 Spotlight Sunday is new series of interviews designed to introduce and highlight Chicago Urban Sketchers individually. Now that our chapter has reached nearly 500 members it has become more of a challenge to meet every single member in person and have a meaningful conversation. These posts will concentrate on individuals and speak in their own words. And now - spotlight on Debbe Rigney-Hays! Alex Zonis: Why do you sketch, Debbe? 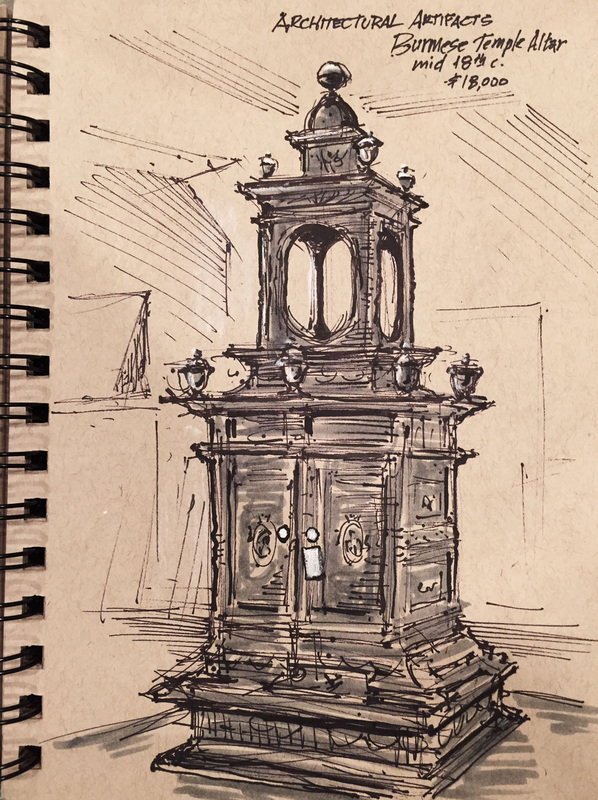 Debbe Rigney-Hays: I sketch because I like the quiet of it, the focus of my attention, seeing things I’d never notice otherwise, which is, in the true sense of the word, awesome. I also like learning tools and concepts of drawing and painting. I also like the journey of finding out what suits me best and seeing how I improve. I have never had art classes or drawn until Sketchbook Skool two years ago. My creativity was used in different places. AZ: What is your favorite sketching tool? DRH: My favorite sketching tool is the Lamy Safari fountain pen with my creations of gray or sepia DeAtramentis document ink or a water-soluble pen with a Pentel water brush, I like how watery they are. 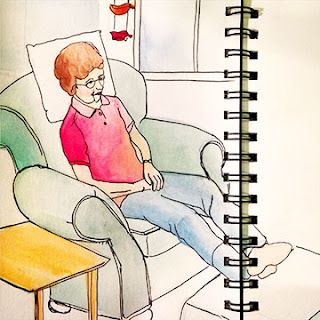 I am learning watercolor, but I’m not coordinated enough, yet, to use it much out and about, so when I want color, I use Faber-Castell watercolor pencils. AZ: What is your favorite place to sketch? 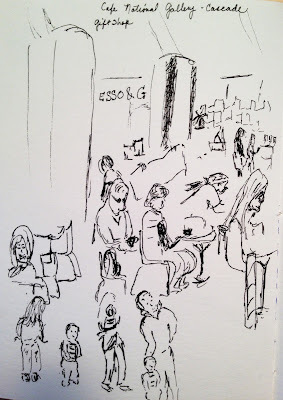 DRH: I love to sketch in restaurants and cafes, busy places where I can easily sit and look around. Sometimes I want to draw the people. Sometimes a building I see from the window. Sometimes it is an architectural element that catches my eye. After the Chicago Symposium’s class on drawing figures in motion, I’ve gotten more courage to try. Still working on it. I hope to sketch more. AZ: Debbe, you sent us two beautiful sketches. What inspired them? Why are these scenes special to you? DRH: This past Christmas, my gift was an overnight in Chicago, by myself. I’m from downstate, with easy Amtrak access. Last month I had a great time poking around, exploring. I loved the old Chicago Library and had to breathe it in another time, but now, as the Cultural Center. 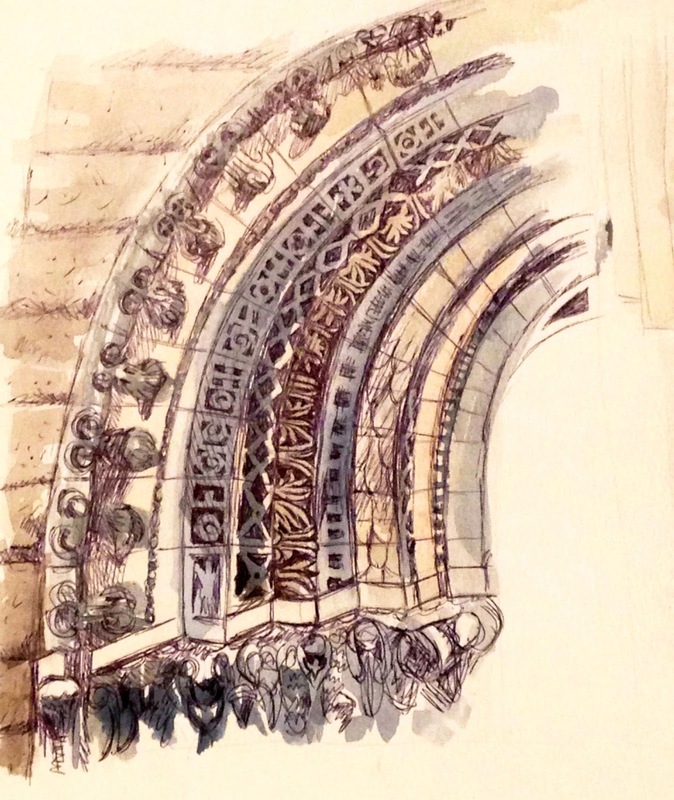 The dome is overwhelming, so I drew some of the arches. I enjoy quotes, so I added some of the Center’s beautiful quotes. Last year’s Symposium classes on the Velazquez Palette and drawing architecture, encouraged me a lot for this sketch. 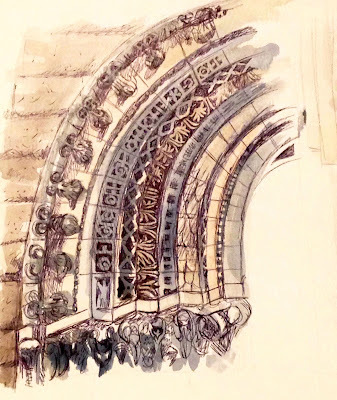 We worked on the arches at the Newberry Library in the Velazquez Palette and in the Architecture class, I discovered I don’t “have” to draw the entire building, just an interesting portion, if I want to. I can make it easier on myself and therefore, more fun! AZ: Debbe lives in Galesburg in West Central Il, near Peoria. It takes her 3 hours by Amtrak train to come to Chicago for our sketch crawls. Thank you for opening our new series, Debbe, and for sharing your sketches and thoughts. Everyone, be sure to stop by and say Hello next time you see Debbe at a sketch crawl.